These shoes are a must have! With a marvelous lemon scent, typical of Lemon Jelly shoes, super comfortable and full of style! I know the purpose of this type of waterproof shoes is that they should be wore on rainy days, but I didn't resist and I am wearing them almost every day. Don't forget, by using the code FFLORES4TFR you have an additional 10% discount on any piece on Feeting Room. Lots of kisses and happy week! 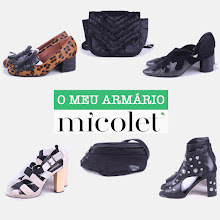 Estes sapatos são uma perdição! Com o cheirinho maravilhoso, típico, da Lemon Jelly, super confortáveis e cheios de pinta! Eu sei que o propósito deste tipo de sapatos impermeáveis é serem usados em dias de chuva, mas não tenho resistido e tenho usado quase todos os dias. Não se esqueçam, ao usarem o código FFLORES4TFR têm um desconto adicional de 10% sobre qualquer peça da Feeting Room. Beijinhos e boa semana!